One of President Donald Trump’s judicial nominees failed to disclose that he is married to a lawyer in the White House counsel’s office. That nominee, Brett Talley, was asked on a disclosure form whether he had any family members who could pose a conflict of interest. Talley is nominated to an Alabama district court. He is one of a handful of Trump’s nominees to be rated as “not qualified” by the American Bar Association. A 36-year-old lawyer whom President Donald Trump nominated for a lifetime federal district judgeship and was deemed “not qualified” by the American Bar Association failed to disclose that he is married to a top White House lawyer when asked to disclose conflicts of interest, The New York Times reported Monday. 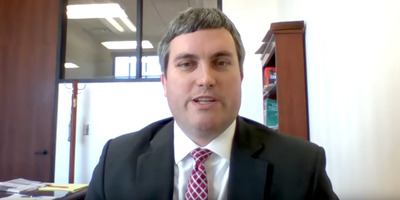 Brett Talley, nominated by Trump to an Alabama vacancy, failed to disclose his marriage to Ann Donaldson, a senior lawyer in the White House Counsel’s office, on public congressional documents. Donaldson is chief of staff to White House counsel Donald McGahn. Asked to list any family members who were “likely to present potential conflicts of interest,” Talley didn’t mention his wife. Donaldson was recently interviewed by special counsel Robert Mueller’s investigators about detailed notes she kept on her conversations with McGahn, which included discussions the two had about the firing of former FBI Director James Comey, The Times reported. Mueller’s team is investigating whether Trump obstructed justice by firing Comey. Mueller was appointed as special counsel after Trump fired Comey earlier this year. The probe into possible obstruction of justice is a part of Mueller’s wider investigation into Russian interference in the 2016 presidential election. Talley, one of just a small handful of judicial nominees to get the “not qualified” rating from the American Bar Association since 1989, was approved by the Senate Judiciary Committee last week on a party-line vote and could be confirmed by the full Senate as soon as this week. In a statement following The Times story, Democratic Sen. Dianne Feinstein of California, the ranking member of the Judiciary Committee, said Talley’s failure to disclose the marriage was a betrayal to the American people. Talley is one of Trump’s most controversial nominees. A Harvard Law School graduate who serves as a deputy assistant attorney general at the Justice Department, he has come under criticism from Democrats for never having tried a case, receiving the rare “not qualified” ABA rating, and writing comments online such as, “Hillary Rotten Clinton” from his now-private Twitter account. The White House has pushed back on the “not qualified” label. Talley is the fourth of Trump’s judicial nominees to receive a “not qualified” rating from the ABA — the second to receive the rating unanimously. Nearly 8% of Trump’s nominees screened by the ABA have received the “not qualified” label, a much higher rate than the judicial nominees of past presidents, such as Presidents George H.W. Bush, Bill Clinton, George W. Bush, and Barack Obama. Trump has, somewhat under the radar, moved to reshape the federal judiciary at lightning speed. His rapid pace of nominations and confirmations to the federal bench highlight an area in which Trump has worked to secure an early legacy. The president was faced with an extraordinary number of vacancies on both district and circuit courts after Obama’s term. In September, Trump hit 65 combined nominations between appeals courts, district courts, the US Tax Court, and the US Court of Federal Claims.